This decadent dairy-free and egg-free dessert is excellent for a celebration, especially for peanut butter lovers. Be sure you have at least one day ahead of serving to prepare this pie, as it takes time to chill. Give yourself an extra day if you are making the whipped coconut cream; see note in the recipe instructions. 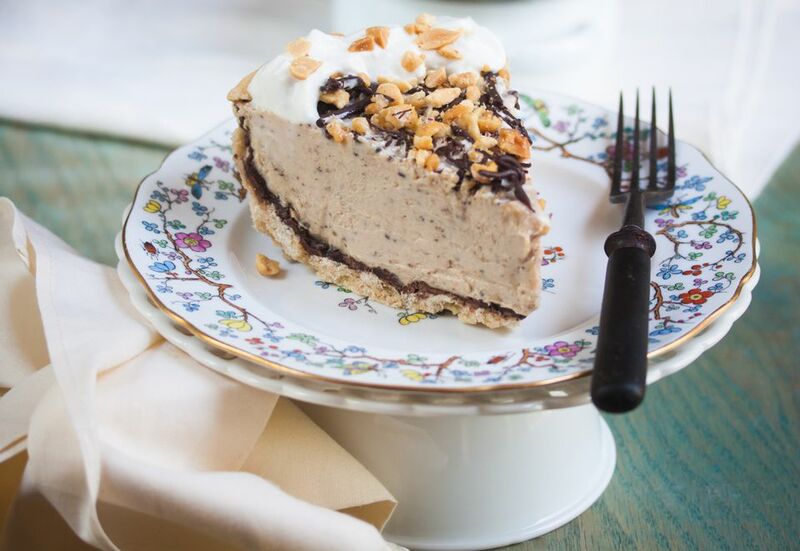 You can also use prepared vegan whipped cream, which will cut down considerably on prep time. I've had good luck locating vegan whipped cream in natural foods stores and larger grocery stores with an ample vegan/vegetarian section. Preheat your oven to 400 F. Bake the pie crust for 10 minutes and then remove from the oven. Evenly sprinkle 1/3 cup of the chocolate chips onto the hot pie crust. Let rest a few seconds and then use the back of a spoon to spread the chocolate in a thin layer all over the crust. Allow the crust to cool completely until the chocolate is hardened. Feel free to place the pie crust in the refrigerator to expedite this step. In the bowl of a food processor, place the extra firm silken tofu, 2 cups peanut butter, 2 cups peanut butter, chia seeds and salt and blend until smooth, stopping and scraping down the sides of the bowl as needed. Spread the filling into the prepared pie crust and transfer to the freezer. Cover lightly and chill for 4 hours. After chilling, melt the remaining chocolate in a double boiler or microwave and drizzle lightly over the top of the pie. Garnish with crushed roasted peanuts and serve chilled.